Lynn Coburn takes in the view of the Animas River Valley, Animas City Mountain and the La Plata range from the highpoint of Raider Ridge off Smokejumper Trail. Suspended rimrocks thrust into open air. 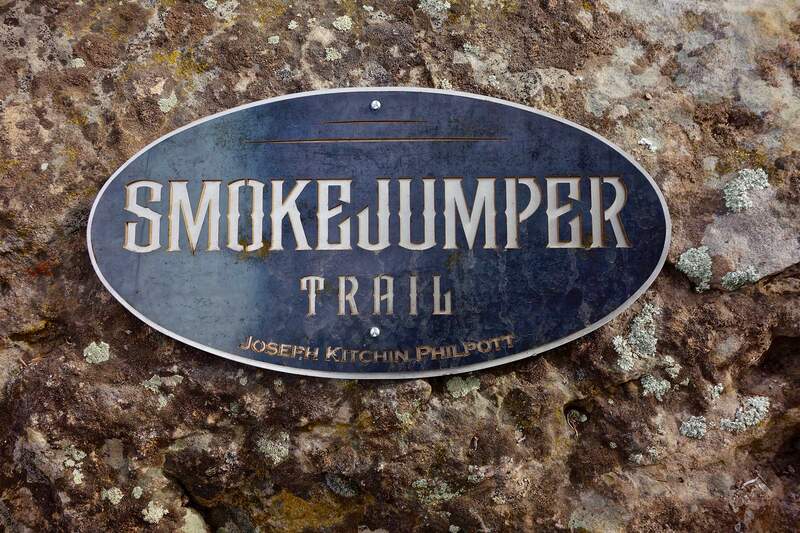 Smokejumper Trail was built by Trails 2000 and a host of volunteers in autumn of 2017 to honor Durango native Joseph Philpott. It is five ridgetop miles from the southern end of Raider Ridge to Point 7,954’ on the Smokejumper Trail. The loop returns on the Sugar Trail to Horse Gulch Road. The thru-hike leaves the ridge on the Skyline Trail and descends west to the Skyridge Trailhead. Shorten your hike by taking advantage of one of several lateral trails. On snowless, sunny winter days, local trails provide consolation. Raider Ridge runs the length of Durango from southwest to northeast. It has a sharp western escarpment and slopes gently into Horse Gulch on the east. 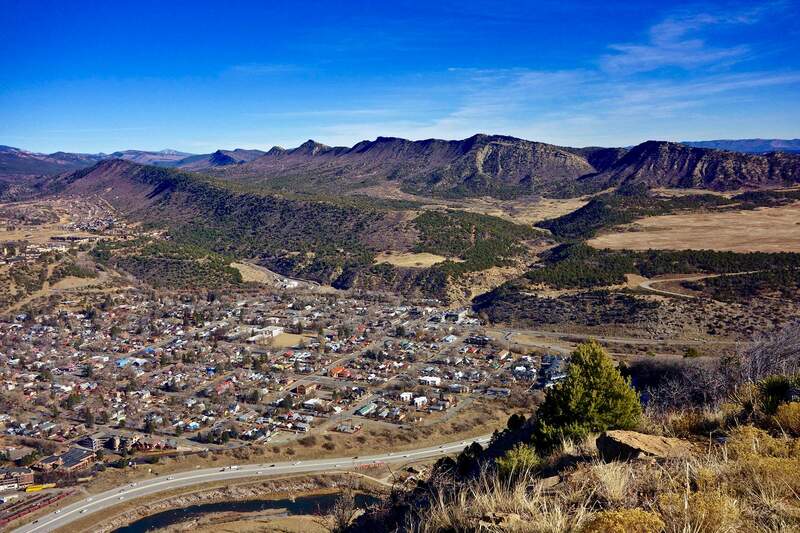 It gathers stature as it moves north; the highest crest is more than 1,300 feet above the Animas River Valley. The hike described runs along the ridgecrest for five miles beginning at the Horse Gulch Trailhead and turning around at the tallest prominence on Raider Ridge. 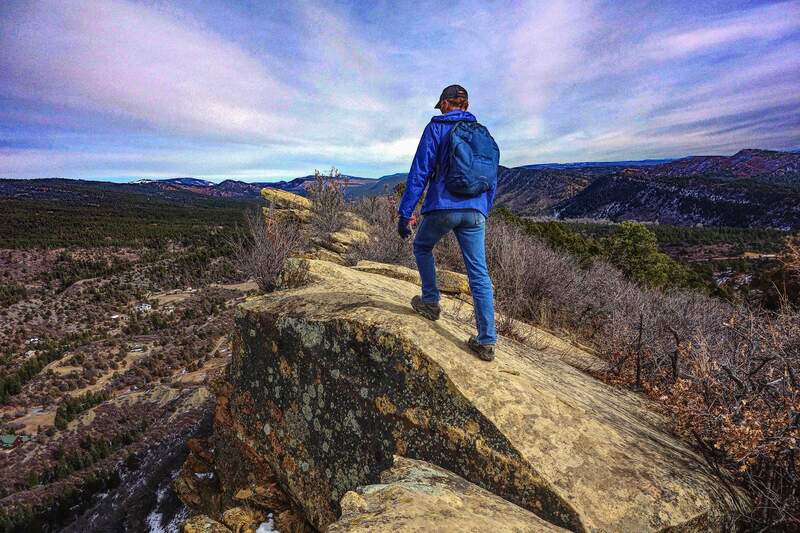 Create a thru-hike to the Skyridge Trailhead with a short shuttle, or loop back to the start. Horse Gulch Trailhead Trails 2000, Durango’s trail advocacy group, has created and maintained a world-class system of trails in Horse Gulch. From the parking lot at 6,600 feet, walk up Horse Gulch Road, a mixed-use dirt track. In winter, the shaded initial road segment is the coldest, snowiest and slickest part of the hike. In just more than half a mile, go left on unsigned Zipline. The track follows the contour west around the southern end of the ridge. Snake CharmerAt 0.7 mile, hook a sharp right on Snake Charmer, a one-way downhill mountain bike track. In 2013, trail foreman Tyson Swasey of Moab worked with Trails 2000 crew leaders and community volunteers to construct the progressive course. While there are alternative lines with varying degrees of difficulty, there is no easy route down this technical, steep descent. Hikers beware! Bikes have the right-of-way – be ready to leap clear of the track. If this makes you squeamish, use Rocky Road to access the ridge. Jackson Lacek is hucking down Medicine at 20 mph about to go airborne. Momentum is necessary for survival. Bikers careen down rock-armored terrain, fly across stonework bridges and ride the rocks around banked corners. Catch serious air on ledge drops and stone jumps. Flagstones were laid so expertly the trail looks like a backyard patio. Ascend a slickrock slab. At 1.3 miles, another downhill ripper veers off from Snake Charmer at a weathered boulder 100 yards from the ridgetop. The Gravity Council, a Trails 2000 advisory group, supervised the reconstruction of Medicine in 2015. Bikers huck down Medicine where momentum is necessary for survival. Hikers are strongly advised to avoid this trail. Snake Charmer intersects the ridgeline at 1.3 miles. From here, there is a sweet view of the south end of town, Perins Peak and the La Plata Mountains. Turn north and roll with the landscape. Politely spaced piñon and Rocky Mountain juniper don’t interfere with the continuously evolving westward visual field. Rocky Road intersects Raider Ridge at 1.7 miles at the top of the “Black Hill Climb.” Rocky Road is the easiest and safest lateral for hikers and bikers. If you are short on time, descend this track to create a classic loop. You can’t miss this junction because the surface is covered with a soft black coal/shale mix. 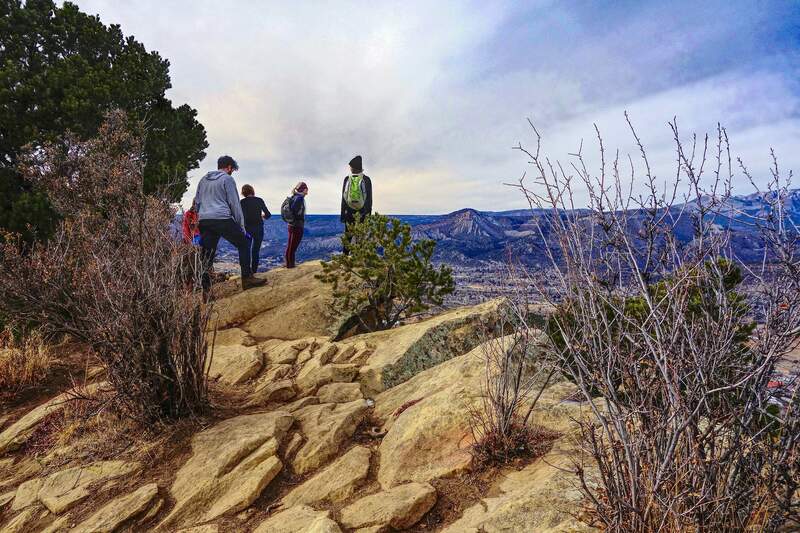 Geologically, Raider is comprised of the Mesa Verde Group. At this location, the Menefee Formation is holding up the ridgecrest. Extended RidgeThe next trail segment is Extended Ridge. The constricted and stony spine is the most technical part of the whole trail system and mountain biking is rated Advanced/Expert. A grove of ponderosa line the west side of the backbone. The ridge is edgy and, while it falls away sharply, the trail platform is generous. Rollers follow one after another. The north end of Rocky Road leaves the ridge at 2.5 miles in a saddle. This is another bailout option into Horse Gulch. Hyper Extended RidgeHyper Extended Ridge carries on north of the Rocky Road junction. In 2008, Mary Monroe, executive director of Trails 2000, negotiated access from Jake Dalla for the Single Speed World Championships. The city of Durango purchased the property in 2012. North of Point 7,536’, the treadway is even more rugged and delightful. Walk along the sandstone rim where gaps are filled with boulders maneuvered into place to create passage for bikes. Many riders will hike-a-bike across these slanted blocks. Exposed on the ridgecrest is Cliff House Formation distinctive for its yellow hue. 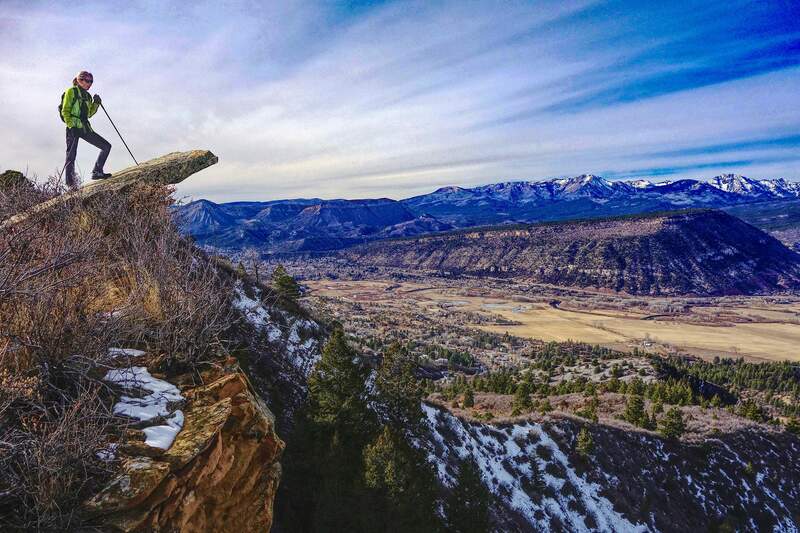 As seen from Smelter Mountain, Raider Ridge runs the length of Durango forming a natural boundary on the east. The south entrance to Sugar Trail leaves the ridge shy of the next hilltop. Keep going! At 4.1 miles, stand on the most popular viewing platform on Raider Ridge, Point 7,897’. It is the highest prominence south of the Skyline Trail. Capstones flare into the sky. Do a visual sweep from the Animas River oxbows up the eastern front of the La Plata range. Four-Way Trail JunctionFour trails join 4.2 miles into the hike in a white fir forest on BLM property: Hyper Extended Ridge (south), Skyline (west), Smokejumper (north), and a link to Sugar (east). Our trek to the highpoint of Raider goes out Smokejumper Trail and returns to this junction. Roundtrip, the spur adds 1.4 miles and 250 feet of vertical. Smokejumper TrailSmokejumper was built by Trails 2000 and a host of volunteers in autumn of 2017 to honor Durango native Joseph Philpott. Joe died in an avalanche in 2013 at age 27. At that time, he worked as a smokejumper based in Boise, Idaho. The Philpott family placed a commemorative plaque 0.3 mile out the trail on a knoll at 7,880 feet. Chris Blackshear walks on a rocky flange on the Smokejumper Trail. Walking north on the ridgecrest trail is glorious – now we can go farther than ever before. The trail zips down Joe’s knoll on sculpted banked turns and out onto the open ridge. From here, you can see the bulky Missionary Ridge cuesta, Baldy Mountain and the far end of the river valley encircled by high peaks. Ponderosa are a whole order larger than elsewhere on the ridge, giants really. Wind in the trees creates a song only pines know how to sing. Rather than turning around on Point 7,954’, take a few steps farther to suspended rimrocks thrusting into nothingness. Back at the four-way junction, loop hikers will go east on Sugar Trail and thru-hikers will descend west on Skyline Trail. Sugar TrailThe curious name is derived from an acronym, SHGR, Skyline to Horse Gulch Road. Monroe hatched the idea to connect the popular treadways. Daryl Crites designed and built the trail in 2015 with a Trails 2000 work crew. 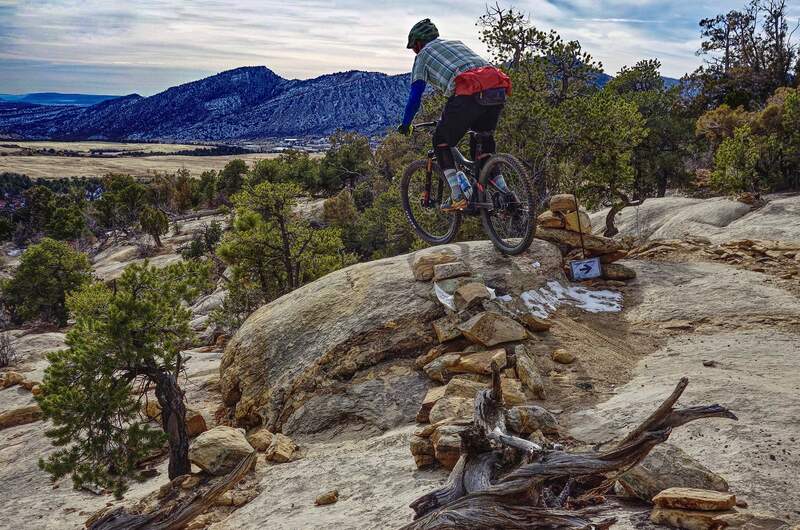 This super-sweet trail is rated intermediate for mountain bikers. It is a 1.6 mile, multi-use, two-way track with an average 8-percent grade. The wide dirt path progresses southerly while incorporating banked swooping turns to Horse Gulch Road. The junction is marked with a massive cairn atop a shale heap 2.3 miles from the trailhead. Horse Gulch Road has its charms. In winter, rabbitbrush has gone to creamy seed, golden grasses are backlit and red willow fill the ditches. The most popular viewing platform on Raider Ridge is Point 7,897’ just south of Skyline Trail. Capstones flare into the sky. From the four-way junction, the trail drops 820 feet over 1.9 miles to the Skyridge Trailhead. This pathway is close to perfect – packed dirt, roomy enough to pass, gentle grade, and ceaselessly beautiful. Skyline carries a steady stream of bikers, runners, hikers and dogs. Near the top, Douglass fir are as big as their old-growth ponderosa companions. Wind down the west-facing slope through boulders cut loose from cliffs above. Arrive at your destination amongst big sagebrush. Travel to Horse Gulch Trailhead: From East 8th Avenue, turn east on 3rd Street. Park in the designated lot on the right. Travel to Skyridge Trailhead: From Goeglein Gulch Road, turn east on Jenkins Ranch Road and drive 1.3 miles to the trailhead on the right. Distance and Elevation Gain: The loop and spur to the Raider highpoint is 9.7 miles with 1,700 feet of elevation gain. 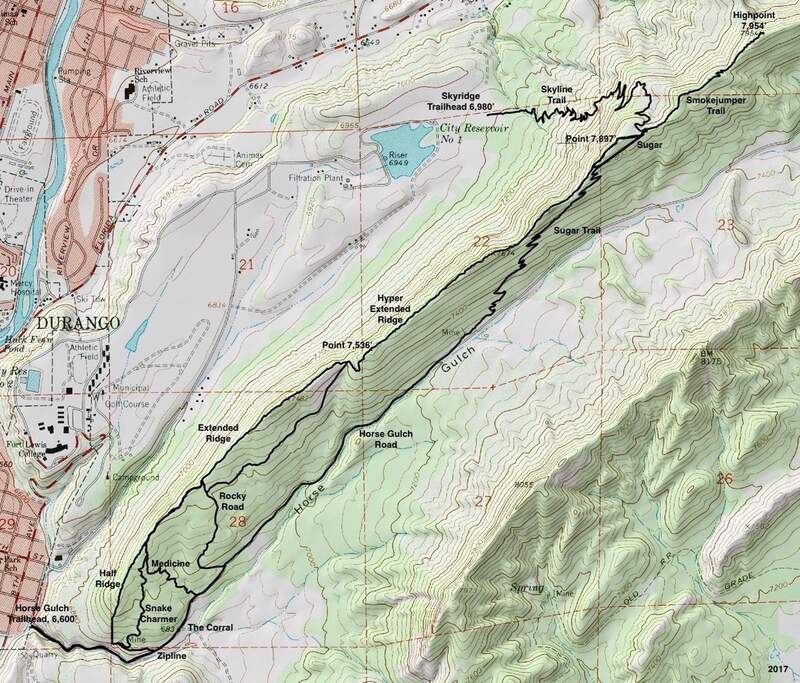 The thru-hike to Skyridge, including the spur, has the same vertical but is only 7.5 miles. Time: The loop will take 4 hours, 30 minutes to 6:30. The thru-hike is an hour shorter. Difficulty: Trail; no exposure; navigation moderate. Sign posts have been installed; Trails 2000 is in the process of creating directional maps. Please stay on established trails.